Earn $10.99 in VIP credit (1099 points)What's This? Shimano's PD-A600 delivers the comfort and stability of large platform road pedals with the convenience of SPD -- all with the excellent quality construction you'd expect from an Ultegra level component. An excellent lightweight option for touring or commuting when extended comfort and ease of walking are of concern. Just FYI, if you're looking to increase your Q factor, the spindles on these pedals fit very nicely into the WIDE Ultegra pedals. They give you another 4mm of length, over the 4mm the Ultegra pedals already give you. That's 8mm total on each side. And they work PERFECTLY. I like to ride in the off road type SPD pedals the road because the shoes and cleats are easier to walk in. These pedals have a bigger platform than many off road type. I have them on my road bike and my touring bike and really like them. My only complaint about the pedals these replaced, are the originals scratched very easily. Best clipless choice for commuting. Good pedals. I elected to stay with SPD cleats when I upgraded pedals because of thier excellent walkability. These pedals deliver solid yet lightweight construction and a good, stable feel through the pedal stroke. I'm thankful I was able to upgrade pedals and still avoid clip-clopping about in exposed cleats and ruining my office tile like some sort of hooligan! If you prefer SPD cleats but you're looking for a wider platform in an SPD pedal for more comfort and foot support on longer rides, this is an excellent alternative. 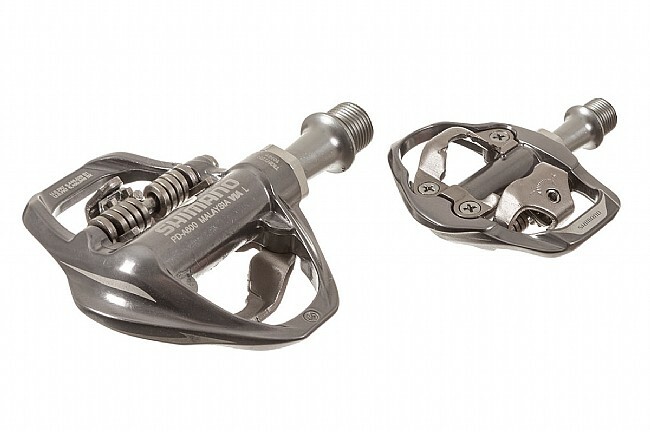 They are considerably lighter weight than Shimano's double-sided MTB pedals and they are as durable and reliable, making them an excellent choice for road biking and touring. Some riders may find the single-sided pedal less compatible for stop-and-go street riding, but I find them as easy to use on busy streets as on open roads - experienced SPD pedal users will have no difficulty flipping the pedal to the cleat side in one smooth motion and clipping in. They shed mud and debris as well as any MTB pedal. After 15,000 miles these pedals are considerably scraped up but no worse for the wear and tear, still performing as flawlessly as ever. You like SPD's for walking in but don't really need a double sided pedal? This is the answer, an SPD that is designed for road use. This is my second set that I use for my commuter bike and now for my trike. I like the wider platform of the single sided clip since I am not having to get in and out as frequently. This is the easiest pedal I own for getting in and out of especially on my trike. Best option to save a little weight and keep the mt. bike shoes. I bought these to put on my gravel bike. Interestingly, they weight less then Ultegra road pedals, but have close to the same surface area. The advantage of going to these were that they match the performance of my road pedals, but let me use a shoe that can be walked in. I paired them with a set of stiff carbon sole mountain bike shoes, and they have worked well for me with this combination. As other reviewers have noted, they are only one sided, which may not work in certain situations, but since I am use to road style pedals, they are not an issue for me. I like SPD so I can walk in the shoes and not slip on my rear. These pedals are longer than most MTB pedal, which seems to eliminate a hot spot I was getting under my toes. I liked my mtb spd pedals & shoes so much that I realized I should also put spd pedals on my road bike. I use the same shoes (Sidi mtb) for both mtb & road, now. These pedals are solid performers using a nice platform for sole support. These are one-sided pedals, not dual like my mtb spd pedals. i normally use SPD-SL cleats for road use but was preparing for a 7-day tour across Iowa, the RAGBRAI. This was my first time to do a ride like this and the friend I was riding with said we would be doing a lot of walking. He recommended SPD pedals with shoes that would be easy to walk in. My wife already uses these pedals with the Shimano SM-SH56 SPD Cleats which are very easy to get in and out of so I decided to try them. Combined with some cycling sandals, they turned out to be a comfortable alternative that were very functional for the RAGBRAI which featured so many riders that we had to walk thru every town we went thru. I was glad that I changed to these pedals. I plan on using them for a bike and barge tour we are planning on doing this fall. I prefer MTB shoes on my road bike, these pedals are light weight, look good and work well! What more could one ask for? 10 of 16 customers found this review helpful. the one sided clip-in gravitates to the bottom, must turn pedal over before clipping in. Not so good for commuters who ride in city traffic with numerous stops at lights and intersections. As noted above you have to turn the pedal over before clipping in. This is a nuisance and a potential hazard for commuters. Otherwise, the pedal is very light, very stable, and it transfers power very well. Ideal for touring. I used to use 2-sided mtn bike pedals on my road bike. The Shimano PC-A600 pedals are more comfortable because the platform is larger. I prefer wearing mtn bike shoes on my road bike so that I can walk around without slipping. Also the price is right. Really nice pedals. Love the ride feel and the solid connection to my shoes. They are a little tough when commuting since you have to clip in and out frequently. Although I only road bike, I prefer SPD (versus SPD-SL) because I like to walk normally in the shoes when I'm off the bike (at a cafe, for example). I have been using Shimano M520 pedals for a year, which are double-sided but your only contact point with the shoe is the clip itself. These A600s look to be a good solution to someone like me who wants to stay on SPD but is looking for a bit more contact area- hoping that a bigger contact area between my shoes and the pedals will allow me to have a bit more stability on the pedal and transfer more power through the pedal than before. I did not have any problem with the M520s, so this is more of a let's see if this helps purchase. Because these pedals are one-sided, it does take more time to clip in...can't just blindly stamp down like I did with the double-sided pedals. I wish the pedals would spin a bit more freely, so that they would always hang down in the same position (pointing upward). The bearings seems to have a bit of friction to them so the pedals don't always return to the same rotation under gravity. Also, my shoes don't seem to clip in as clearly as they used to- I often don't hear the click, it's more of a mash. Clipping out is fine-same effort as the previous pedals. I have bad feet this pedal is very comfortable. I put in over 100 miles a week. A very good single sided pedal. Purchased these for a new bike project six months ago. Very smooth bearings compared to the A520 which I have on another bike. Adjust tension back all the way neg. then add 12 to 34 turn pos. to start with which worked for me. I am 5'-8 at 150 a larger/stronger rider may need to add more tension. A good mountain bike shoe and SPD cleats are hard to beat unless your are a team rider and road pedals are SOP. Another plus, I read in Bicycle Quarterly these pedals have bearings that can be rebuilt. Do not worry about scratches it just means you are not riding enough! Great pedal for the price and you almost forget about them they work that well. Buy a pair and enjoy. I hate the need for two sets of shoes/pedals - one for road, one for mtb. This pedal solves that problem. I put a pair on my high-end carbon road frame, and haven't looked back. Weight is good, platform is great, one-sided works great on the road when you're not in and out of the pedal a lot (such as MTB), and the SPD system is the same as my MTB, meaning I'm not scrounging around for the other shoes everytime I want to change my ride. Buy 'em.